If you know, you know – but put simply, KFC gravy is the fried chicken sidekick of the gods. Now KFC has gone one further and captured the essence of its famous golden gravy in an epic limited-edition run of scented candles. KFC gravy superfans can get their hands on one of 230 limited edition candles, which will be available on a first come, first served basis via here. 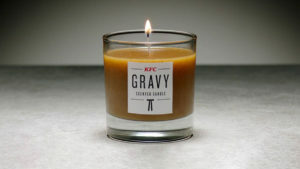 The artisanal KFC Gravy Candle has been expertly infused with the soothing aromas of the nation’s favourite gravy. For those looking to fully embrace the ultimate KFChill experience, KFC also offers a dedicated site to help gravy fanatics find their zen – www.kfchill.co.uk. Simply listen, breathe in and breathe out, as the soothing sound of simmering gravy melts away your stress.